Some decisions just happen. Maybe a gradual thought process pulls us naturally in one direction, or life and circumstances convene in such a way that the decision is simply made for us. But other decisions are concentrated into a single, weighty moment in which it seems everything hangs in the balance. Deciding to become a full-time freelance writer was that sort of decision for me: concentrated, exciting, terrifying, momentous, life-changing. It meant trading in everything known and predictable—a regular paycheck (with taxes taken out), a place to go each morning at a consistent time, bosses to tell me what they wanted me to spend my time on, and colleagues to collaborate with. Of course, plenty of people think those regular, predictable things aren’t so great, especially when they see me sitting in cafes with my laptop, running my own writing business and being my own boss. But trust me, it’s a leap—one that results in what feels, at least for a time, like a free-fall. There are times when life doesn’t turn out as you expected. Then there are times when life punches you in the gut, takes your wallet, and leaves you hanging upside down by your toenails. 2009 was one of those times for me (the gut-punching kind). …Part of the change included laying aside my aspirations for wealth and taking up the vocation of my dreams: I would try to make money writing full time. It’s the beginning of a story that would make a great book, which is why I’m so glad Shawn did just that: He wrote a book about his first year writing full time. 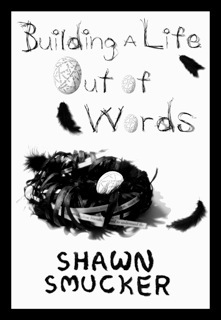 Building a Life Out of Words was released as an e-book today. If you’ve ever thought about writing for a living, this is a story you won’t want to miss. Not only will it make you feel less alone in your doubts and fears, it’s also packed with practical advice and inspiration. (The book even includes a handful of essays by others (including me!) who have built viable careers out of words. But even if you’ve never dreamed of dropping everything to write full time you should get the book, because it’s not just a story about the writing life. It’s also a story about vocation and how we define ourselves; about dreams crushed and hoped; about money, marriage and difficult decisions; about living simply, thinking deeply, working hard and keeping the faith. It’s a story about regret, and also about how the “hardest days” can become “launching points into new and previously uncharted territory.” It’s a story about a life falling apart and then being put back together in a wholly new way, using new materials. Best of all, Shawn writes about all of these things in a way that’s truly special. Shawn’s gift for honest, vivid storytelling—for making me feel like I’m right there with him, in whatever physical setting or emotional landscape he’s describing—never lets me down. The entire process was fraught with dangerous hope and the possibility for a fantastic level of failure. I was Evil Knievel, preparing to launch over a canyon of criticism and skepticism and self-doubt. A slight hitch in my momentum could have proven lethal. Lucky for us, Shawn’s writing career is on solid ground. We can all learn from his wisdom and savor his words—on his blog, at Twitter, and, of course, in his new e-book, Building a Life Out of Words. I can’t wait to see what he does next. is it in any other form but ebook? Looks good.